If you want to draw attention at an event or any type of promotion, Hollywood Signs is your solution for digitally printed banners - any size, any color, any design. We use the right technology, equipment, and materials to ensure you receive the best product for your application. 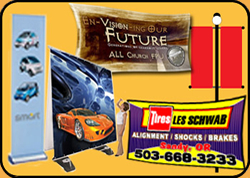 Whether you need one custom banner or hundreds we can make it happen. Whether you need a small banner or a gigantic banner, with just text or full color, contact Hollywood Signs.